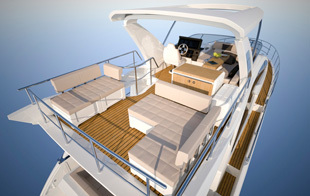 The new Azimut 50 will replace the 48 when it is launched next month. what’s good about this model and applying it to a 50-footer. abundance through tasteful use of dark woods and trim with cream fabrics. and a low-slung lounging area aft. 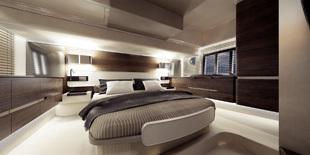 good, though, to challenge the likes of the Princess 52 and Ferretti 530.